Pull up to a home—any home, anywhere—and evaluate what you see. That initial impression you get, created by everything from the surrounding landscaping to the building’s façade, determines the curb appeal of that property. A popular buzzword in today’s real estate, curb appeal means simply what you’d expect: it is the appeal of a lot as seen from the curb. Because it is primarily concerned with first impressions, curb appeal becomes all-important in terms of a home sale. As in job interviews, first dates and meetings with new business clients, you only get one chance to make a first impression. The opportunity to impress a buyer can disappear in moments, and what the exterior of your home says can just as easily turn a buyer away as it can lure him or her inside. At the same time, when done right, curb appeal has the potential to wow interested buyers, making them say things like, “This is the one!” before even opening the front door. So it’s no surprise that this hot topic has inspired several television programs and remains a common subject of home-improvement magazines and Web sites. If you’re selling a home, make sure it starts off on the right foot with potential buyers! Here are five factors that contribute to curb appeal: Evaluate each from the perspective of a visitor. Strengthening these aspects will strengthen your home’s curb appeal! 1. Maintenance: The structure of your home says a lot to buyers about the interior. If the exterior has been well-maintained, it implies that the living spaces will be the same way. Take a good look at your home: Is anything in need of repair? Inspect the doors, windows, screens, railings, trim and building façade. Many times, it’s a good idea to give your home a fresh paint job, to help strengthen the like-new impression. 2. Walkways/Driveway: If buyers will pull up your driveway and step onto your front walkway, you can be sure they’ll notice cracks or damages. Not only should be repair such things, but you may also choose to powerwash the driveway for a fresh appearance, or in certain cases, it’s a good idea to repave it. 3. Landscaping: Think of flowers and other foliage as the accessories of real estate, like a great bag or a necklace add style to your wardrobe. 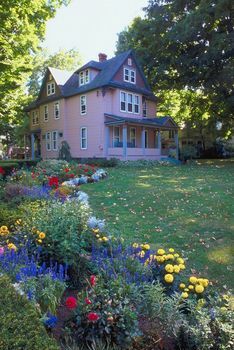 Perfect for adding punches of color and decorative accents to your property, landscaping can be designed to your liking! 4. Manicuring: No matter how much you invest into your landscaping, it won’t be worth much if you don’t take care of it. Mow the lawn, trim the bushes, pull weeds: do everything possible to make the foliage look its finest! 5. Overall Effect: Beyond evaluating each factor of your curb appeal, it’s also important to look at the overall effect. After all, this is what potential buyers will most likely notice first. Aim to create a seamless, coherent appearance by painting the home façade and the garage in identical or complementary colors, for example. Whatever landscaping you add, make sure it all coordinates nicely.